A simple formalism is proposed that leads to the unified treatment of many problems in Structural Mechanics. 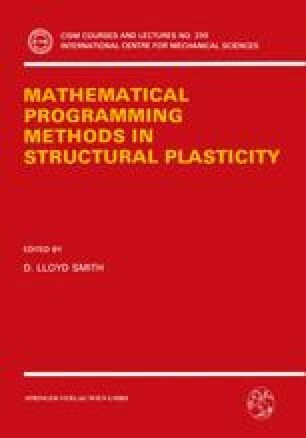 Such are the self-adjoint problems of statics of structures made of linear elastic, piecewise-linear elastic, elastic-plastic or rigid-plastic material. The linear part of the complete set of governing relations for each of those problems has symmetric matrix of coefficients with positive/negative definite submatrices along the diagonal. Hence, such a set can be replaced by a minimax problem, which in turn is equivalent to a pair of dual Quadratic Programming or Linear Programming problems. If inequalities are absent, then the dual problems are further reducable to the sets of equations corresponding to the Direct Stiffness (Displacement) Method and Flexibility (Force) Method. Otherwise no reduction is possible and either the dual problems must be solved directly (Direct Energy Approach) or the clasical methods should be applied in an iterative manner. In any case the proposed methodology allows us to establish easily the existence and uniqueness properties of the solution.